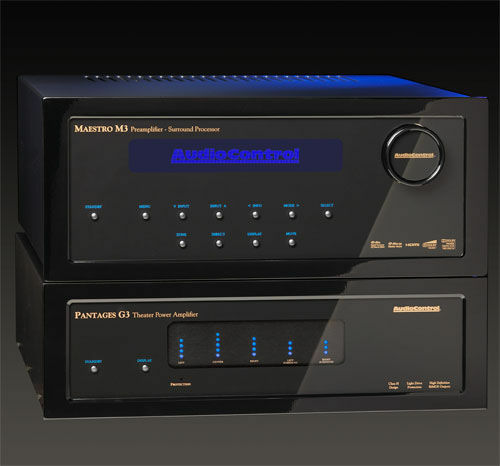 Mountlake Terrace, WA — Home theater enthusiasts can now rejoice as AudioControl, the U.S. based designer and manufacturer of high performance components, announced they have begun shipping their new multi-channel theater amplifier, the Pantages G3. The Pantages G3 is a five-channel amplifier that incorporates a unique and highly efficient Class H design that allows it to produce 230 watts into each channel, at an 8-ohm load. Total audio output is over 1200 watts RMS! Designed as a matching companion to AudioControl’s new Maestro M3 theater pre-amp processor, the Pantages G3 incorporates a simple yet elegant design. Highlighted by refined Rose Gold lettering on a high gloss black display, the sleek front panel is also accentuated by “cool blue” LED indicators that compliment the exquisite cosmetics of the Pantages G3. By utilizing a Class-H design topology, increases the efficiency of the Pantages G3, increases reliability, and reduces heat and unnecessary power dissipation. This design results in superior energy efficiency and is used in several other award winning AudioControl amplifiers; recipients of the CES Innovations and the Electronic House Product Of The Year awards. The Pantages G3 incorporates AudioControl’s LightDrive Anti-Clipping Protection Circuit, which safely eliminates any possibility of speaker damaging clipping and distortion, even in extreme conditions. Audio enthusiasts can enjoy their audio systems at even the most “aggressive” levels. In addition to pristine audio performance, the Pantages G3 sports desirable user features like balanced XLR and unbalanced RCA inputs, Remote Power Control triggers and audiophile grade, five-way binding posts to guarantee the optimum connection of speaker level signals. AudioControl is a U.S. designer and manufacturer of highest quality theater processors, distributed audio amplifiers, signal processors and precise analysis products, celebrating more than 30 years of making good sound better. The company’s headquarters, including research and development, manufacturing, production, and training facilities continue to thrive in Mountlake Terrace, Washington; heart of the rainforest of the Pacific Northwest. AudioControl®, Pantages G3, Maestro M3 and “Making Good Sound Better®” are trademarks of Electronic Engineering and Manufacturing, Inc.